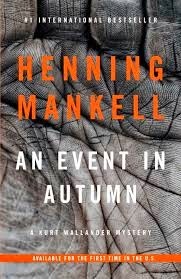 Even though we thought we'd seen the last of Kurt Wallander, he makes a return appearance in An Event in Autumn by Henning Mankell. In this novella, Wallander is thinking of buying a house in the country, but the first house he goes to view turns out to have skeletons not in the closet, but buried in the yard. Wallander has grown tired of city life and longs to move to the country and get a dog. His daughter Linda is also living with him in his apartment in town and working with him on the police force. So whether he wants to distance himself from the city living or his daughter is not really clear! His co-worker Martinson knows he's looking for a place in the country, so when his wife's relative has to move from his farmhouse to a nursing home, it seems like great timing. Wallander takes the keys to the house and goes out to view it. As he's looking around the garden, he trips over something. On closer inspection, it turns out to be a bony hand sticking up from the ground. Naturally, forensic officers come in for a look and end up discovering the skeleton. The medical examiner can't be more specific than to say that the body has been in the ground "for a long time." The skeleton belongs to a woman in her 50s who died from hanging. So suicide is considered, but if that were the case, how did she end up buried in the garden? Wallander, as he's been known to do, goes back to the house to look around, and notices that some bushes seem out of place. More digging ensues and what do you know, there's another body down there. This time, the body is that of a man, and once again, it's not exactly "fresh." Wallander and his team begin looking at the history of the house and trying to trace its former occupants. This leads them all the way back to the chaotic war years, when refugees were flooding in and records weren't as well-kept as they are today. Also in keeping with his usual practice, Wallander goes off to investigate some hunches, and ends up in some hot water . . . but of course he's able to solve the crime and live to fight another day. Although he decides this particular house is not the one for him! The book also contains a very interesting afterward written by Henning Mankell where he talks about how he came up with the idea for the Wallander character, and his surprise at the global popularity of the books. This book was originally published in Holland as a giveaway for people who bought another mystery novel. The events in this story are meant to take place just before the last Wallander book, A Troubled Man. There is a bit of foreshadowing of the events in that book, with Wallander being depressed and uneasy at visiting elderly people, and worrying about his own future. I've always had a soft spot for Wallander, since "Mördare Utan Ansikte" (Faceless Killers) was the first book I was able to read in Swedish. I still remember the thrill of picking it up in the local library, paging through it, and realizing I understood it (more or less). So Kurt and I go way back! I'm distressed to read that Mankell says in the afterward of this book that absolutely, positively, this is the last we will hear of Kurt Wallander. He doesn't rule out future books with Linda, however, so I'm hoping that we will get some news of him from her stories!